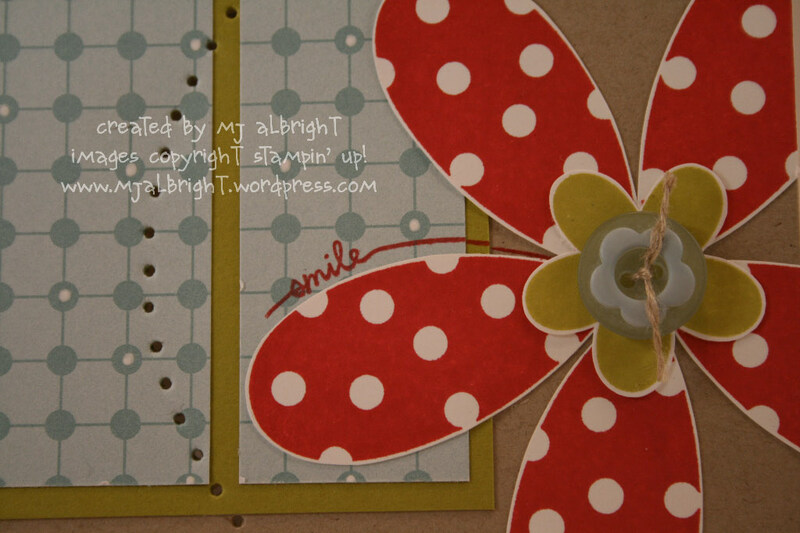 I wanted to use Stampin’ Up!’s Pick a Petal stamp set that I’ve neglected to use for quite some time. Dusted it off and inked it up a little. I wanted to use all of the same petals but wanted a simple sentiment to flow with the design of the card. I used part of one of the petals…the one that is a flower outline with the word “smile” in it, just to follow the pattern of a petal used. 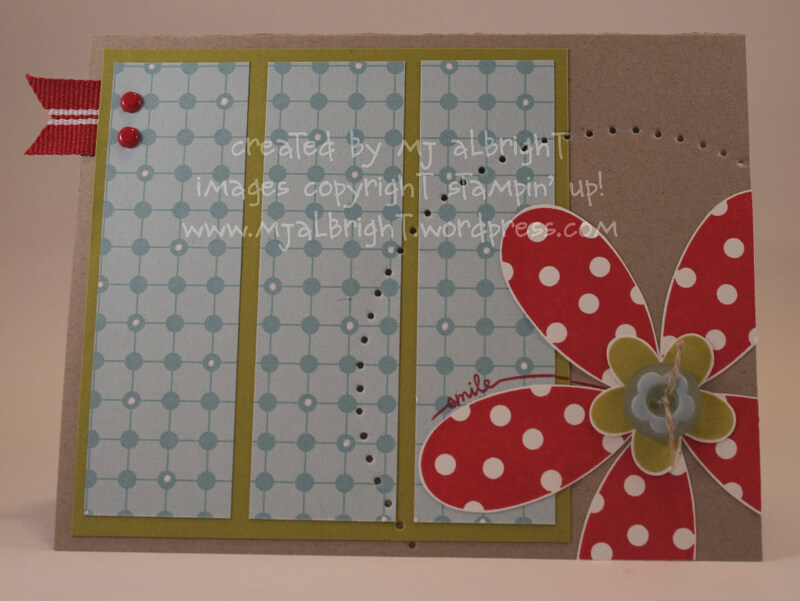 Added some white dots to the patterned paper to coordinate with the stamped petals. To emphasize a circle to the bottom right corner of the card like the sketch, I decided to pierce some holes in a circular pattern to draw your eye to the flower focal point. CARDSTOCK: Kraft, Whisper White, Kiwi Kiss cardstock; Murfield Designer Series Paper. ACCESSORIES: Button bouquet Designer Buttons; Linen Thread; Crafters’ Tool Kit; Riding Hood Red Striped Grosgrain Ribbon; Bold Brights Brads Assortment; uni-ball Signo White gel pen. FYI….today is the last day to sign up for the create-a-calendar class. See info –>here. WOW this card is absolutley STUNNING! I LOVE, LOVE, LOVE it. What a great use of the sketch. You have done such a fantastic job! I love this card..especially how you did the paper piercing. Great detail! Oh, wow, I haven’t used that petal set in the longest time, but you’re making me want to use it again! This is one of the nicest card I’ve seen done with it. You’ve used Beate’s sketch beautifully. Love the pierced circle around the flower! Beautiful, MJ — love the color balance and that big bloom! Piercing is a wonderful touch! It’s great to see Pick a petal used so nicely again. I’ve neglected it too. Live the button & layering with these pretty colors! Thanks for the inspiration! Mary Jo, this is ADORABLE! LOVE that big flower! Oh fabulous! I’m so glad you’ve gotten out this set and inspired me to do the same. I also haven’t used it in a while! You have the most unique designs- no wonder your blog gets so many hits! Not only are the colors on this card just WOW, the piercing makes a huge statement. Would love to case this someday! TFS! So cute!! I haven’t pulled this set out for awhile, this card makes me want to get it out! Ah man!!!! That stamp set has not seen ink in soooooo long. I think I may need to pull it out. Just love the colors and the card. I think this is an awesome card. I am going to the Seattle Regionals on Sat., April 18th. I would like to make a similar card to swap. My questions are 1. Do you care if I use your design (with different colors) and 2. Is putting on the recipe designed by Mary Jo Albright how I give you credit? I am very excited to be moving to Carlisle PA for a year…I didn’t realize that you are in Harrisburg…maybe I will be able to attend a class of yours.